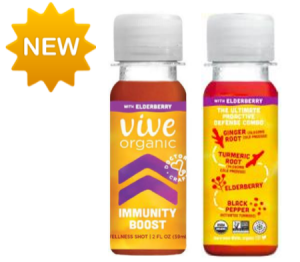 New Vive Immunity Boost with Elderberry! Packed with flavonoids and anti-oxidants, Vive will keep your customers healthy in this long winter with Ginger + Turmeric + Elderberry + Pomegranate Juice. Want more info? Check out these Vive facts. Now through March 8, buy 3 cases Vive Immunity Original or Elderberry (or a mix of both), get 1 case Elderberry free. If you’re not already a Vive customer, ask us for a free starter kit. This eye-catching display comes with ice bowl, signage & clip, and brochure & brochure stand.